To be the Best, the Highest Degree of Excellence Must be Achieved. It is far easier to make this claim than it is to prove the fact. The one thing that will set it apart from the commonplace. Based on this idea, the collectors will pass their critical judgement. The Art Itself Must - and Does. This is the continuing story of Ultimate Triumph...of Mind and Talent ….Over Matter. written delicately and indelibly upon the sands of time. Only the fortunate few will be able to share a part of this dream. You Must Consider the Glass Art by the Lotton Family. and many designs are special commissions by the Lotton Gazebo Gallery. so you can see how Important it is to Reserve Your Selection Immediately. A large part of their Glass is being Shown in museums all over the world. Including the Smithsonian Institute and the Metropolitan Museum. Lotton’s Specialty is their Flowers and their Colors. They work constantly with Expensive Earth Minerals to Achieve their Special Colors. No One Equals Their Flowers Or Their Colors. At The Lotton Gazebo Gallery, We Offer 0nly The Best, Knowing That The Disappointment Of Poor Quality Last Long After The Satisfaction Of Low Price Has Been Forgotten. The Gazebo has been in Business since 1971, and in 1974, the owners of the Gazebo began a relationship, both personal and business, with Charles Lotton, Daniel Lotton and David Lotton that would span the next 38 years to the present, and ultimately to the Lotton Gazebo Gallery. We feature the largest selection of Lotton Glass. Lotton glass is documented today in the Permanent collections of museums such as the Smithsonian, the Metropolitan, the Corning Museum, the High Museum, the Toledo Museum, and The Art Institute of Chicago; and many throughout Europe. Charles Lotton and all of the Lottons are entirely self-taught. Years of trial and error have brought them the success they enjoy today and the collectors a rare opportunity to own investment art that will continue to reward, in the future, those who have the insight to purchase their art today. The Lottons MAKE ALL their Own Glass. Most artists buy Corning Glass for their Clear Glass and Melt it down. The Lottons make their own glass compositions. Most artists buy the Kugler Color Rods from Germany and Melt them down. The Lottons Make their own Colors. This is really important. Many artists have tried to BUY the Lotton Colors. Quite Frankly, The Lottons are not foolish enough to Sell their Own Colors. The Lottons will be known for their COLORS and their Beautiful Florals. No one has been able to touch them on their Flowers. I believe you should always buy the Very BEST you can Afford……and Stretch…a Little Bit. Lotton Glass Appreciates In Value. I sell more glass when stocks are down a little. Clients will pull out of stock accounts and invest in Lotton Glass. They KNOW it is NOT going to go DOWN in Value. This is Why I sell Lotton Art Glass as Investment Art Glass. Every piece of Lotton Glass is A One of a Kind. They even make their own bronze castings for their lamps. We can discuss any piece of art or I can take more pictures for you. I want You to be Happy. I do Not offer Returns, Only because the Glass is Heavy and Expensive to ship, And there is always a chance of damage. I offer Free Shipping and ship fully insured. I also deliver...within reason. If you have any questions about their glass, Please Feel Free to Call me. If I am not available to answer your call, please leave a message and I will return your call. Aprox. Size 7" by 5"
Museum Quality. Premier Piece of Glass. 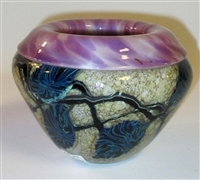 Aprox Size 8 by 13"
Beautiful Vere de Soire With Pink/Purple Iris Flowers. This is a Museum quality piece. Lamps have a great resale value on the Antique Market. Nothing Dominates a room like a well appointed Lamp. Aprox Size 9" by 11"
Copyright © 2013 Lotton Gazebo Gallery. All Rights Reserved. Built with Volusion.